Let’s agree right off the bat, “Therefore I Am” was a tremendous episode of The Flash. There are always truly great episodes that emerge from each season and stand head and shoulders above the rest, but I was honestly shocked to discover that this one was going to rank among such episodes. When Clifford DeVoe was first formally introduced at the beginning of this season (keen fans will remember that Abra Kadabra dropped the name for the first time during his appearance last season), I wrote an entire piece about the history of the character in the comics as it could potentially apply to The Flash. If you are interested in revisiting that piece, you can find it right here. Rather than rehashing the four-color history of the first non-speedster villain we’re seeing on The Flash, I want to address something that is more related to the structure of the episode itself. The Thinker is super cool and his wife, the Mechanic, is equally as interesting. Which we learned as their history together was gradually revealed tonight through flashbacks. Flashbacks have traditionally been the domain of Arrow and an important part of that show’s narrative structure. Now, that’s not to say that they haven’t been prevalent across all of the #DCTV shows. Supergirl had a number of flashbacks to Krypton throughout the first season, The Flash has looked back at Joe West with tiny Barry and Iris and DC’s Legends of Tomorrow saw Rip Hunter reliving the loss of his family over and over again. But for five seasons, Arrow made flashbacks a part of the DNA of the show, running mirror flashback plots alongside their present-day plot in order to reveal crucial information and backstory about a character that helped inform that character’s actions in the present day. Honestly, when The Flash first launched, I was surprised that it didn’t follow the same structure. Well, in case anyone may wonder if The Flash’s writing team lacked the chops to pull it off, tonight’s episode put that to rest. Turns out The Flash does flashbacks pretty well! 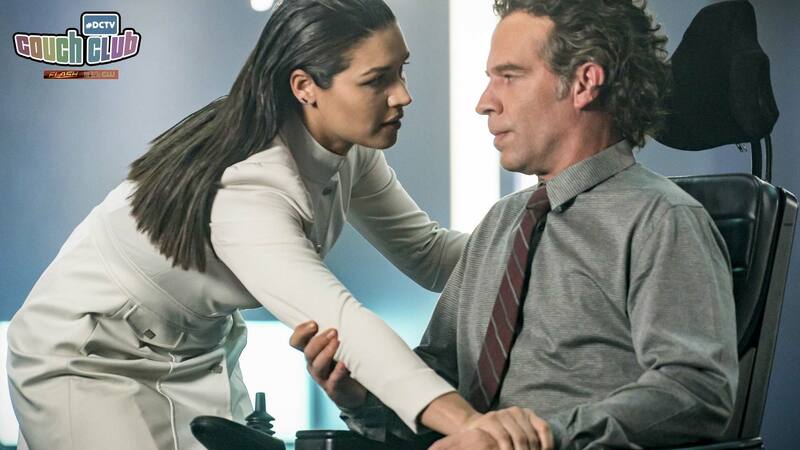 Not only was it nice to get Neil Sandilands up and out of the Thinker’s chair and doing some truly tremendous acting, there was something very nice about returning to the events of the pilot episode of The Flash. I have a special fondness for Harrison Wells in any-slash-all of his forms, so I was delighted to see the evil Eobard version of him back in traditional form around the time of the particle accelerator accident. It was also interesting to throw back to the Barry and Iris that couldn’t even entertain the idea of being together because they saw each other more as siblings than potential love interests. The younger, more innocent versions of themselves stand in stark contrast to the fully formed adults who are on the cusp of pledging their lives to each other. The return to the particle accelerator itself is something else that I think was really, really smart. This season of The Flash has gone out of its way to distinguish itself from the legacy of episodes that have come before. Overall, I think it illustrates some smart turning away from tropes and themes that have become probably too comfortable or familiar. I had been enjoying the bus origin for this new group of metahumans and would have been happy to never again see another evildoing metahuman who’d had the bad luck to be within range of the accelerator blast. In the end, though, it was brilliant! I think uniting the classic human flaw of hubris with the crazy power of the particle accelerator serves a dual purpose. From a literary standpoint, the Thinker has been reframed as a tragic hero. Clifford DeVoe garnered a fair bit of empathy—perhaps even to the point of pathos—in spite of the fact that his goal remains foggy. We know he wants to know everything, but we don’t yet know why. We’re rooting for his marriage to remain preserved and for his health to hold on, which are things that we will all hope for ourselves at one point of another. By about the halfway point of “Therefore I Am,” I found myself hoping for the same things for Clifford DeVoe that I’ve hoped for Barry Allen over the course of my time watching The Flash. This Shakespearean-level twist on someone who could easily have become just a moustache-twirling villain has succeeded in presenting the Thinker as a contender for the best ongoing villain The Flash has ever had. These flashbacks have also led me to hope that in spite of whatever is going to go down between the Thinker, the Mechanic and Team Flash, that the couples on both sides remain preserved and get some version of a happily ever after. I’m not sure if I’m willing to bet on whose happiness yet. I would love to know what your thoughts on tonight’s flashbacks are and if you’d like to maybe see more of them in future episodes of The Flash! Jump into the comments section and I’ll be checking out your responses.